CHICAGO--(BUSINESS WIRE)-- Hyatt Hotels Corporation (NYSE: H) today announced the opening of Hyatt Regency Tashkent, the first Hyatt-branded hotel in Uzbekistan. The opening of Hyatt Regency Tashkent further expands Hyatt’s brand presence throughout Central Asia and significantly enriches its authentic and diversified brand experiences for guests. Hyatt Regency Tashkent offers guests easy access to local landmarks and tourist attractions, including the National Library, Chorsu Bazaar, Amir Temur Museum, and Mustaqillik Square. Additionally, business travelers will be in close proximity to nearby government offices, embassies and numerous corporate offices. 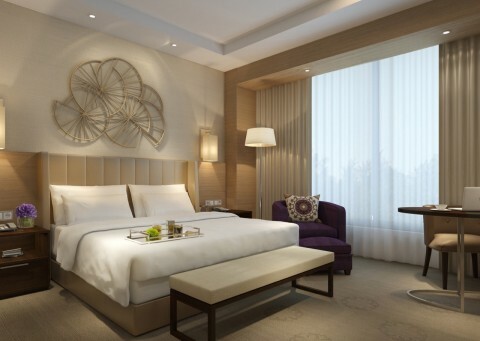 With 300 guestrooms, including 52 suites, Hyatt Regency Tashkent offers bright, spacious accommodations with floor-to-ceiling windows that are elegantly decorated with contemporary furniture and locally inspired artwork. Each guestroom has a generous workspace with an ergonomic chair and charging station; bathrooms feature a soothing walk-in rain shower with separate bathtub. Regency Club rooms and suites include access to the Regency Club lounge on the sixth floor, serving complimentary continental breakfast, as well as evening cocktails and hors d'oeuvres. The restaurants at Hyatt Regency Tashkent build off Hyatt’s history of culinary excellence. Sette Pizza Bistro and Bar offers an authentic Italian pizza in a vibrant atmosphere with rooftop dining featuring skyline views of Tashkent. Khiva Café, an all-day dining restaurant, is located on the hotel’s ground floor and offers guests international breakfast items and local specialities. Lunch and dinner menus feature authentic Uzbek and Central Asian cuisine. Chai Lounge features freshly brewed coffee, a wide selection of teas and delicious pastries and bakery items. Guests can also enjoy a lively bar on the seventh floor, which features a DJ-mixing table and an outdoor terrace that provides a selection of shisha flavors. Open to guests beginning late afternoon, the bar serves a variety of cocktails and after dinner offerings. Hyatt Regency Tashkent is the perfect venue for a variety of events such as weddings, social banquets, exhibitions, meetings, and conferences in the heart of Uzbekistan’s capitol. With more than 12,900 square feet (1,200 square meters) of flexible meeting and event facilities, including a more than 6,400 square foot (600 square meter) ballroom, the hotel provides thoughtfully designed multifunctional spaces with high-tech audiovisual and lighting solutions. For more information, please visit www.tashkent.regency.hyatt.com.